Wipeout is good fun for children, adults or corporate entertainment. Can you escape the tornado or will you be swept away into the distance of Lancaster? The aim of the game is for eight players to stand on podiums while the centre console revolves. The centre console has extending arms that will try to knock each opponent off one by one. The last person standing will be declared the winner. To make the game interesting the spinning arms can also change direction. Lancaster & North West Tornado It’s a knock out! 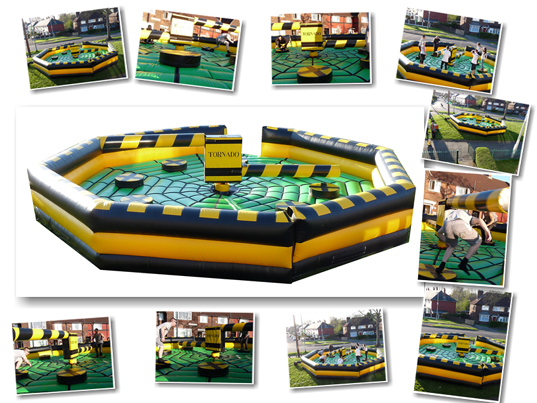 Rodeo Empire will deliver Tornado Ultimate Wipeout to Alderley Edgeand other areas across the North West. Please see the prices page for information regarding delivery (some areas free). Lancaster and North West Tornado Ultimate Wipeout may also be known as "it’s a knockout", "sweeper" or "last man standing". Wipeout comes fully staffed, insured and clean. The unit is 30x30ft and we will require access to a mains power supply. Please see the requirements page for details. Cannot Read? Click Here to generate a new one. © 2016All Rights Reserved Rodeo Empire Manchester.